The live performance was possibly the best Opera I have ever attended – but mere enthusiasm for a loved opera in a loved setting is not enough to commend it. The concept works on many levels but let me begin with the magic of seeing events performed in the place in which they were set. Peter Grimes is the story of an Aldeburgh fisherman who loses apprentices in unfortunate circumstances and the setting of the North Sea as a backdrop was electrifying. Importantly though we could hear the sea in the music, we could feel the wind and smell the salt air. Many of us sat on the shingles for a few hours of pelvic discomfort but with little grumbling. Of course the music and singers were superb. The cast working with head microphones (there must have been fifty channels to mix!) did a solid job of not letting technology, the novelty, the weather or anything else divert them from doing their jobs well. It was odd to have the music pre-recorded but it would probably not have worked to have live musicians – the humidity alone would put paid to any tuning. What struck me most though was the terrific sense of space. 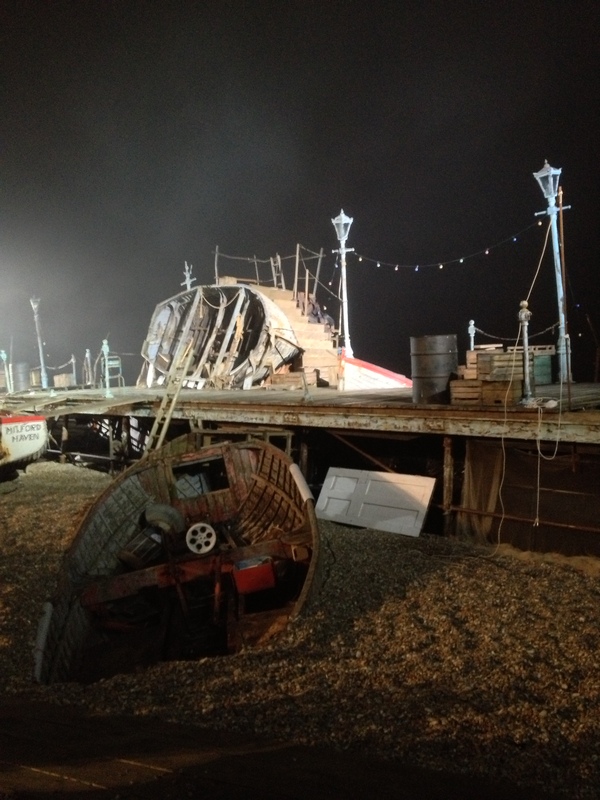 The stage, unconfined by a building , was over 50 metres wide, and the cast walked off to wider parts , the sounds of their footstep’s in the shingle creating another of the signature sounds of the beach. Cleverly, the director (Tim Albery) chose to set the story in 1945, the year of its first performance, and he managed to time a spitfire to fly overhead in the first scene. So our soundstage was 100 metres wide, hundreds of metres deep with aeroplanes and sea sounds, and further dimensioned through the smells and sensations of being there. Alan Oke as Grimes was the perfect singer for the role and a credible successor to Pears. He exuded the grim greyness of the North sea in the way that an Italian tenor could never muster (imagine a Pavarotti trying this out!). And Giselle Allen as Ellen Orford was performed in a convincing and sensitive manner. It’s hard to recommend this highly enough. Buy it – enjoy it and see the DVD.